While last week was known for parity and chaos, this week was more unassuming and less noteworthy. There weren’t a ton of upsets or top 25 matches to shake the rankings. Still, a bit of movement occurred throughout as we now head into conference play which should add a whole new element. As for now, BYU remains number one to kick off the week four list. BYU remained steady as the top team in the country with a pair of sweeps, including a quick one of in-state rival Utah. They’ve got a real chance of finishing the regular season unbeaten as they head into the WCC this week. The Cardinal took care of Texas twice and were really impressive in doing so. That makes them a continued firm choice at number two as now they look to defend their Pac-12 title. With all of the movement last week, Wisconsin staid put at three for the time being. They showed why this week, with a dominant sweep on the road against in-state foe Marquette to round out the top three. The Fighting Illini put on quite the performance in the non-conference, going unbeaten with some impressive wins. On that list includes three over then-ranked opponents (two currently in the top 15) and a couple more against teams on the cusp. It’s now a nine-match winning streak for the Huskers as they head into Big Ten play. It will truly be a challenge for such a young team, but they’ve clearly shown in the non-conference that they have all of the talent you could ask for. Texas could quite match Stanford, but two losses to the Cardinal isn’t a back-breaker. They have just a one match week to open up the Big 12, but it’s going to be very tricky playing at one of the tougher league road environments in a solid Kansas State team. A strong 9-1 start to the season, but not a ton of ranked matches. Now the Nittany Lions are about to get very much tested in the Big Ten, and it comes right at them in week one. We will see the barometer for this team in their Big Ten opener. The Golden Gophers were supposed to play a top 25 ranked Kansas State team, but had to cancel the match due to unsafe playing conditions. It’s a shame, because now Minnesota heads into Big Ten play still without a ranked win, but they’ll have plenty of opportunities ahead. The Panthers finished the non-conference unbeaten, and in a league where no other team is ranked, it’s not unthinkable that they could finish the regular season that way. Still, there are a lot of tough matches to trip up in, and Pitt will be looking to defend their ACC crown more so than going undefeated. The Trojans bucked their tough trend of losing three of five with a pair of victories heading into Pac-12 play. The one over San Diego gave them their fifth win over an opponent that was ranked at the time of play too. The Gators have now won five straight after the upset loss to Northern Arizona. They’ll carry the SEC flag headed into league play but there could be more parity this year than the past two. The Bears almost had another big letdown against UTSA one week after falling to UTRGV. Still, they got over the hump and then swept Virginia Tech. Now comes the real test as they look to contend for a Big 12 title. The Bluejays did lose a match, but it was very close on the road against a really good Illinois team. They also won all six other sets, so move up a spot headed into Big East play with a huge clash against Marquette to come. The Huskies earned three straight sweeps against lesser competition and now head into Pac-12 action in the top 15. They’ll have a couple of ranked opponents to welcome them into it. It was a short week for the Bruins, who after a four-set win are still searching for their first sweep of the season. Overall they’ve impressed though with the tough Pac-12 slate starting off on the road. Oregon escaped on the road against a solid Hawaii team in five and with a sweep, so they’ve now won seven of their last eight matches. They’ll look to stay hot as they open up Pac-12 action with ranked opponents. The Golden Eagles couldn’t take out their in-state foe, but have put together an impressive non-conference. Now comes the question if they truly can knock off Creighton from the top of the Big East, which they’ll have a good answer to as early as this week. The Mustangs have a chance at hosting in the NCAA Tournament first couple of rounds after what they did in the non-conference. They’ll still need to take care of business and roll in Big West play, which starts this week. Michigan rounded out non-conference play unbeaten, but didn’t play any ranked opponents. Their closest competition to it, Colorado State, was on the cusp at the time, but no team they’ve beaten are even in that classification yet. So we will see who the real Michigan is this week. The Boilermakers are unbeaten heading into Big Ten action, but their closest win to a ranked one was this past week over Alabama. Now they’ll be plenty tested starting with a top five opponent in Illinois. Washington State was so close to ending non-conference play unbeaten, but fell in five to a solid ETSU squad – who has beaten Duke and Tennessee as well. They’ll look to rebound with a tough opening week. The Wildcats now look to start fresh in SEC play after a rough go of things – compared to expectations – in non-conference. That could be the best thing for them as it’s a new season of sorts. Kansas State didn’t get to test themselves against Minnesota as the match was cancelled, but a 10-1 record in the non-conference speaks for itself. Instead, a barometer for them will be against Texas at home this week. 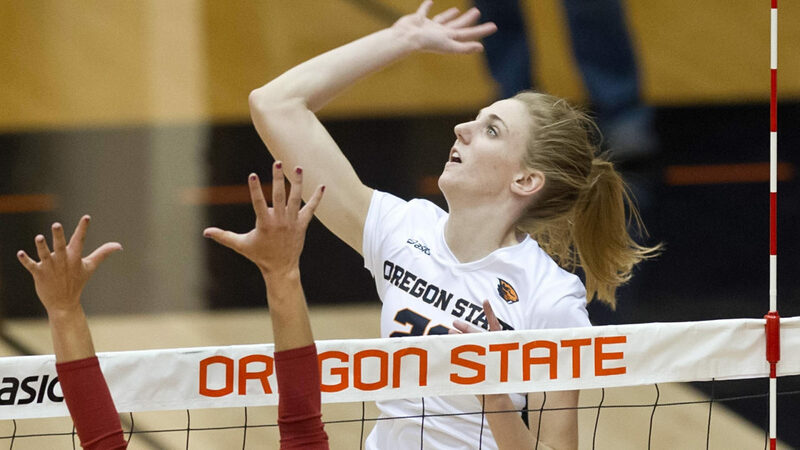 The Beavers got another five-set win over a ranked opponent in downing San Diego – after upending Iowa State earlier this season. They’ll start Pac-12 play ranked because of it. The Utes aren’t penalized for losing on the road against the number one team in the country and will start Pac-12 play ranked. A match with a team on their heels in Colorado starts things off. That’s whack. What is that based on? Some sort of sports pundit hubris that intimates deeper knowledge than what the score board told them. Twice!!! And Baylor loses last night and Utah loses and PSU loses (ok, I’ll give ’em that one). Bet Marquette beats Creighton. At least they knew enough to drop by beloved Toreros out of the top 25. Aren’t rankings based on what has happened and not based on what is going to happen? Like how do you predict Baylor losing at home to Tech? These came out Monday. UCLA was probably a mistake but also had that big Baylor win, which looks worse now, so I’m sure it’ll change. Yeah like the comment above, not sure how our rankings are supposed to predict what will happen. We view resume and what has happened. That said, UCLA over Cal Poly seems like a mistake. That Baylor win and one at San Diego were a better duo of wins then UCLA twice at home for a minute but have since fallen, so as of now next week’s should reflect those changes. At the end of the day, rankings are fun but these have no effect on what a team does and what will happen in season. Love the conversation though!